O'Shea Jackson Sr. (born June 15, 1969), better known by his stage name Ice Cube, is an American rapper, actor, screenwriter and producer. He was a member of the well-known rap group N.W.A., who is best known for popularizing the gangsta rap genre with Straight Outta Compton (1988). After leaving N.W.A. in 1989, he began his solo work. 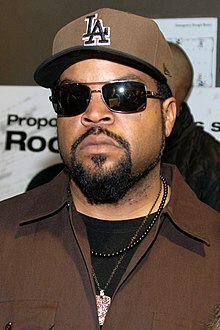 Wikimedia Commons has media related to Ice Cube. This page was last changed on 7 December 2018, at 12:59.